Vivekananda Kendra Kanyakumari a Spiritual Oriented Service Mission. 24-28 Prashikshan shibir for Acharyas started for new 70 Acharyas. Teaching technology,games, Creative learning, Patriotic songs is the content of this training. Skill of organizing society for Nation building through Aanandalayas is the central theme. Jayant Chawra, Ravindranath Savdeykar, Dr Debashish Dey Adhikari, Smt MANJUSHA Lagoo are the resource persons. 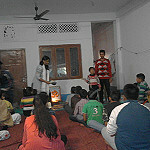 Vivekananda Kendra blog is. Simple theme. Powered by Blogger.